This year, I am excited to bring all of our traditions, new and old, into one. I put together a classic yet whimsical collection of treats for us all to enjoy. I layered brightly colored jellies in clear glass jars for my husband (his favorite), some homemade Earl Grey caramels for my parents, and enchanting Lindt chocolates for me and Everett (What can I say? He has terrific taste even at two years old). 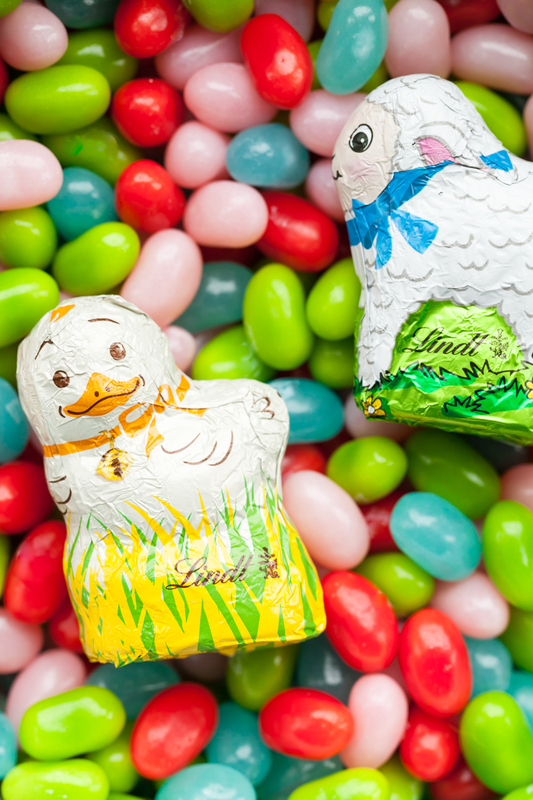 I quickly fell in love with all of the adorable chocolates Lindt came out with this season. I mean, have you seen the little lambs and chicks? Too cute. 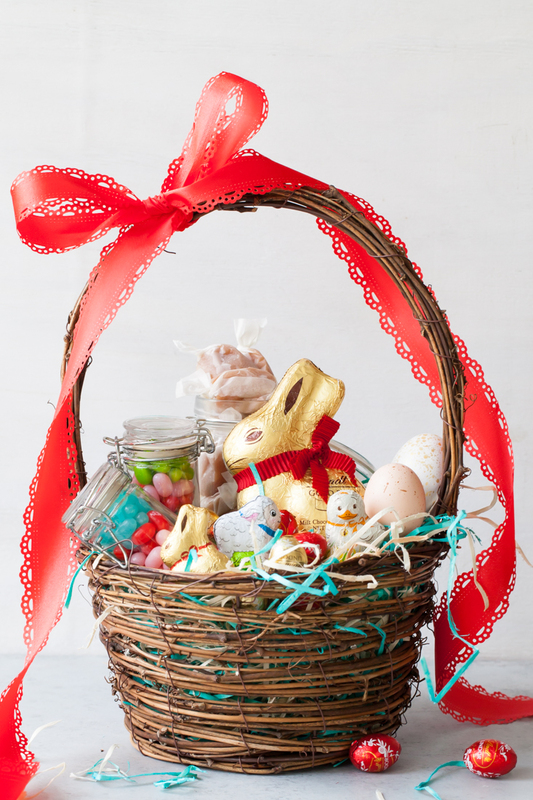 But of course, I knew the classic Lindt GOLD BUNNY with its gold foil wrapping and perfect red bow would be the centerpiece of our Easter basket. 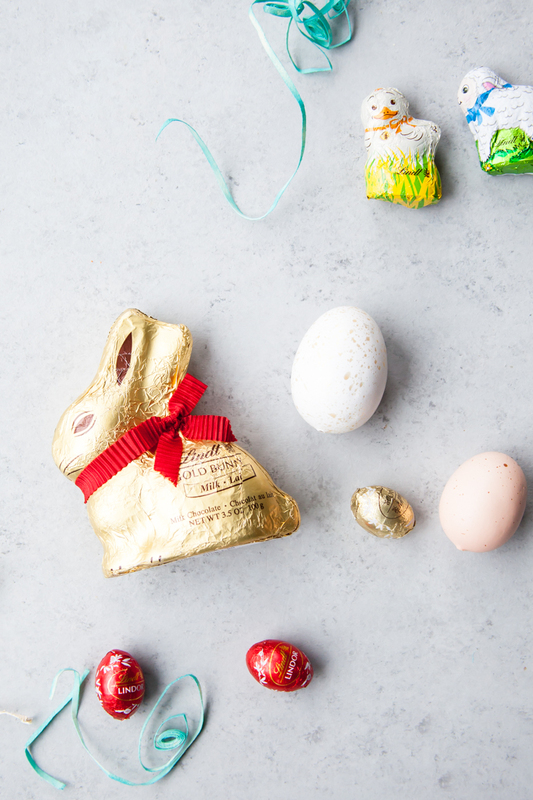 Not only is Everett going to squeal with delight (he already recognizes the Lindt packaging after we included LINDOR Truffles in our advent calendar at Christmas), but the playful yet extraordinary Lindt GOLD BUNNY brings out the inner child in all of us. Edible gifts are one of my favorite things to make and give around each holiday season. For a homemade touch, I’ve included some Earl Grey caramels in our basket. I love Earl Grey everything all year round, but there is just something about the subtle citrus notes from the oils of the bergamot orange that remind me of spring. Earl Grey infuses beautifully into the heavy cream called for in a regular caramel recipe. The vibrant flavors really do shine through! I love a light sprinkle of flakey sea salt on nearly everything, and these caramels are no exception. Add the loose tea and heavy cream to a small saucepan. Place over medium heat and bring to a simmer. Remove from the heat and place a firm-fitting lid on top. Let steep for about 20 to 30 minutes to infuse the tea flavors into the cream. Once done, strain out the tea with a fine mesh sieve and discard the leaves. Meanwhile, line an 8X8 inch pan with parchment and set aside. Combine the sugar, corn syrup, and water in a medium saucepan. Place over high heat. Stir until the sugar beings to melt and the mixture beings to simmer. Stop stirring and bring the mixture up a boil. Continue to cook until the sugar syrup reaches 320 degrees on a candy thermometer. As the mixture approaches 320 degrees, in will begin to darken and turn golden in color. Gently swirl the pan to keep the color consistent and make sure the sugar is heating evenly. Slowly and carefully pour the infused cream into the sugar mixture. It will bubble up quickly, so take caution. Whisk until combined. Return the caramel mixture to the stove over medium-high heat. Cook the caramel, stirring frequently, until it reaches 245 to 250 degrees on a candy thermometer. Remove the pan from the heat and stir in the butter, salt, and vanilla. Pour the caramel mixture into the prepared pan. After it cools for about 20 minutes, sprinkle with flakey sea salt, if desired. Allow continuing to cool, 2 to 3 hours, before cutting into pieces and wrapping in individual squares of parchment paper. *you may also use tea bags(2), but be sure to squeeze out all of the liquid (cream) after steeping.